Nicole Smith is the Facilitator of our Producer’s Unit. 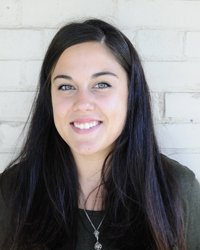 A Metcalf Foundation Producing Intern with Pat The Dog Theatre Creation, Nicole holds a BA in Theatre Studies from the University of Guelph. In 2015 she co-founded The Muddy Mary Project, a theatre festival for emerging artists. Finding Temperance – a play she co-wrote and performed in – was produced by The Muddy Mary Project the same year and supported by the Shaw Festival through a TCR grant. Nicole is the founding Artistic Director of Sonderlust, a KW-based women’s theatre collective, and Producer of four of the organization’s projects-in-development (with awards from the OAC, Canadian Stage (Toronto, ON), Pat the Dog Theatre Creation (Kitchener, ON), Carousel Players (Niagara, ON) and the Region of Waterloo). In collaboration with Lisa O’Connell (founding AD of Pat the Dog), she facilitates The Women’s Room – the first and only female Playwrights Unit in the Waterloo Region. 1. Can you describe what a Producer does or the kinds of things they do? A Producer needs to consider the ultimate goal/vision for the project, how the project is going to get funded, where the project is going to take place, and how the project is going to be promoted. A Producer also needs to consider timelines. When do certain tasks need to be completed? Planning ahead is extremely important, but so is the ability to be flexible. 2. What tools are important for emerging Producers and how does the PlaySmelter Producers Unit go about providing some of them? I think that while there’s no doubt a Producer must be a do-er, having the ability to listen to and learn from other people is also an extremely important thing for emerging Producers to be able to do. With the PlaySmelter Producer’s Unit, we’ve tried to create a balance between these two areas. The Participants in the Unit are “on-call” much of the time while in festival prep and during the shows. During this time, they have the opportunity to do many hands on things like laying floors, sourcing costumes, painting the town with posters, attending rehearsals, setting up the hall and generally just being involved in preparations. But they also have five scheduled intensives from industry pros, all with a vast amount of experience in producing various projects at various levels. Having the ability to not only hear from, but — more importantly — listen to these people, and take from their presentations in order to piece together something that sounds most exciting and makes most sense to them individually, I think, is an invaluable skill to have/learn as an emerging Producer. 3. Why is the Producer’s Unit an important step in growing and sustaining a nascent theatre ecology in Northern Ontario? I think that as an emerging Theatre Creator, the bottom line is that if you have your own ideas for the creation of projects, you’re either going to pitch them to some major players in the ecology and likely end up waiting a long time, or you’re going to learn to produce them yourself. In Northern Ontario, or Kitchener-Waterloo (where I live and work) or anywhere outside of a major city centre — where there are not as many established theatres to pitch to/work for — knowing the logistics of making something yourself (properly and professionally) becomes even more valuable.